There is still a high level of concern among voters in Cork South Central about plans to locate a toxic waste incinerator at Ringaskiddy. Six out of every ten people polled said they were worried about the incinerator. This is the case even though at the time of polling, Indaver Ireland said it had suspended its plans to build a multi-million incinerator at Ringaskiddy. 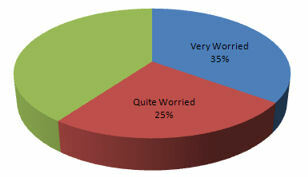 Of those polled, 35% said they were “very worried” about the incinerator, while another 25% said they were quite worried. These figures show that concern about the incinerator is spread across the constituency, and not just in the harbour area. The incinerator, if it goes ahead, will have the capacity to burn 100,000 tonnes a year. But last month, Indaver Ireland said it was putting plans to build incinerator here in Ireland on hold, until incineration gained the economic edge over landfill. The proposal to build the incinerator at Ringaskiddy has been met with stiff opposition at every stage. Anti-incinerator group, Cork Harbour for a Safe Environment (CHASE), has begun a High Court judicial review of the decision to grant planning permission for the incinerator, while residents in Ringaskiddy are seeking permission to bring a similar challenge to the decision to grant the firm a waste permit. Today’s poll results show that incineration is an issue that is still to the forefront of voter’s minds. A VOTE for Fianna Fail or the Progressive Democrats is a vote for incineration in Ringaskiddy – according to environmental campaigners. A spokeswoman for Cork Harbour for a Safe Environment (CHASE), Linda Fitzpatrick said many Cork South Central voters were extremely worried about Incineration because neither party had rulled out the building of 100,000 hazardous waste incinerator in Cork Harbour. She was speaking in the wake of the Evening Echo Red C Cork South Central Poll which revealed there was a high level of concern amongst voters in the constituency. According to the results, six out of every ten people polled said they were worried about the incinerator. 35% said they were “very worried”, while another 25% said they were “quite worried”. Mrs. Fitzpatrick said: “It’s a live issue in this constituency. We would expect the poll to reflect what people do with their votes. What we are saying is not to vote for candidates whose party’s policy includes incineration”. She said representatives from Labour, Fine Gael, Sinn Fein and the Green Party had indicated incineration would not be on their agenda.